Whenever you perform actions such as adding a client to your portal, uploading an invoice or document, or creating a Meeting Request, WorkSpace will generate a Portal Reminder email to send to your client. This email will include the details of what took place and include a link to the file if you uploaded one. To send these reminders, you can either click Yes at the time you are notified of a reminder, or you can go to the Contacts tab, select the Portal button, and choose View Portal Reminders. Your reminder emails will show in a list on the left section of this screen. You can send reminders by clicking Send Selected. This will only send emails which have been checked off in the list. You can also make on-the-fly changes to the Email To address, Subject, and Body of each email. To make changes to any of these templates, go to Setup > My Company > Information & Settings > Email Templates. Is emailing directly from WorkSpace secure? How do I send out an email reminder for appointments? 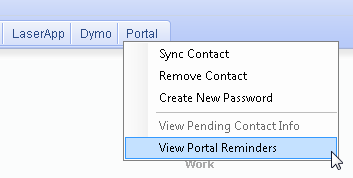 Can I use Outlook to edit the email reminders sent out from the Portal? What does it mean when a staff tries to upload a document and gets the message “Unable to validate Portal subscription”? Why is WorkSpace crashing when I try to download a document from the Portal? Can I send a tax return to a client from WorkSpace? Why does the client portal say “This feature is coming soon”? Can I send more than one document at a time through the Portal?